We are a leading Manufacturer of paper honeycomb pallets (paper base), auto parts packing, thermocol alternative sheets, automotive glass packing solutions and electronic parts packaging solutions from Pune, India. pallets are best material handling consumables. honeycomb pallets are now more strengthful and tough. providing hygienic and clean substitute to wooden pallets. paper pallets are mostly preferred by our customers from pharmaceutical and fabric industries. Honeycomb fitments are made from honeycomb boards or panels. The strength of any fitment lies in its core. Fitments and separators are designed to gain extra strength and provide sturdy grip to product packed in the box. Slots, punch or V-cuts are applied to board for getting shape of fitment. Then slight bending and pasting will convert a honeycomb board into Fitment or corner support. If customer demands for high pressure strength node size 6mm will be more suitable. In case customer need more cushioning the node size 10 mm is preferred. Control Units, Electronic Components, tempered Glass panels, Speaker systems, automobile spares, Furniture assembly parts, etc. 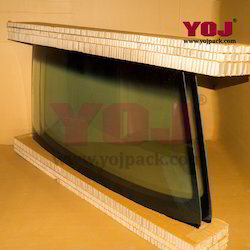 we provide costumized packaging solutions for different types of Glass panels. currently we provide Packing material to Multi-national Companies like General motors and Tata Motors. custom packaging includes Honeycomb material for better support and Corrugated Boxes for outer protection. there are variety of options available. 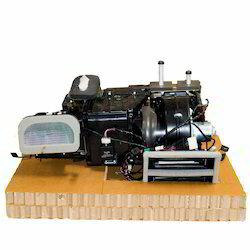 We provide costumized packaging solutions for different types of electronic parts and components.